Wikipedia article on the settlement of Grise Fiord in the Canadian Arctic strongly suggests that Canada in the 1950s was striving to populate its arctic territory in response to challenges to its sovereignty. I had always assumed Canadian control of everything between Greenland and Alaska was undisputed. In what ways were other nations or organisations seeking to undermine Canadian sovereignty in the area? Your basic assumption that there is Canadian control of everything between Greenland and Alaska is more or less true. But there are a few existing problems of sovereignty between the two countries of Canada and Denmark (Greenland). Grise Fiord, Nunavut is located at the southern tip of Ellesmere Island and Grise Fiord is only one of three permanent settlements on the island. The issue of Hans Island then loss traction in popular consciousness and the concerns of the Canadian and Danish governments throughout World War II and the heights of the Cold War, only to reemerge in 1984. 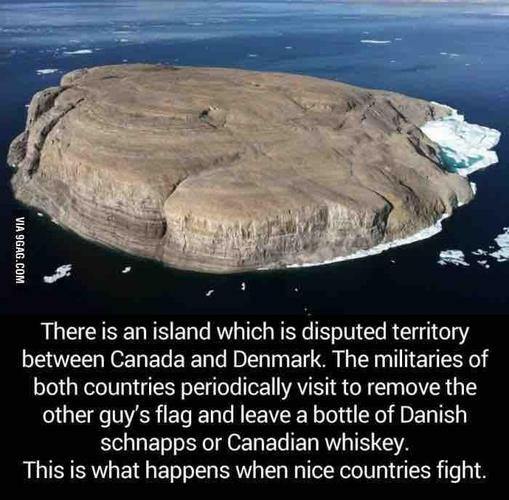 - Two countries have been fighting over an uninhabited island by leaving each other bottles of alcohol for over three decades. After World War II, the League of Nations was replaced by the United Nations, and its PCIJ gave way to the International Court of Justice. Hans Island was mostly overlooked in the 1950s and '60s, and as time passed, rulings from the defunct PCIJ lost clout. When Denmark and Canada negotiated their maritime borders in 1973, they agreed on a wide range of territorial claims — but Hans Island wasn't one of them. 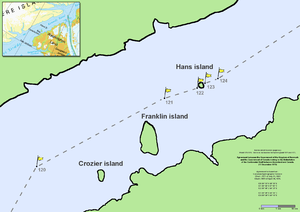 In 1984, Canadian troops made a fateful voyage to Hans Island. In addition to planting Canada's flag in the rock, they also left behind a bottle of Canadian whisky. Just one week later, a Danish official visited the island, replacing Canada's flag with Denmark's and replacing the whisky with a bottle of Danish brandy. He also upped the ante a bit, leaving a note that they were welcomed visitors to Denmark. - Canada, Denmark wage 'whisky war' on the rocks. Not the answer you're looking for? Browse other questions tagged canada border-dispute arctic or ask your own question.